A sugar and vanilla mixture is used to cure salmon overnight. Serve it cold in thin slices with tangy pickled ginger and a green ketchup. For the salmon, put the vanilla pods and sugar into a food processor, blend to a fine purée and then stir in the sea salt. Place some cling film on a clean work surface, then put half the sugar mixture in a line down the centre. Place the salmon fillet on top, skin-side down then sprinkle the rest of the mixture over the top to cover the salmon. Wrap the salmon up loosely with the cling film, then place it on a tray in the fridge for 24 hours. Remove the salmon from the cling film, brush off the salt mixture and rinse it thoroughly under cold water, then pat dry and wrap in clean cling film until ready to serve. For the cucumber ketchup, cut the outer edge of the cucumbers off so that you are left with two long 2cm/¾in square batons. Set aside. Roughly chop the outer parts of the cucumber before putting into a food processor with the rice wine vinegar, sugar and salt. Blend to a fine purée, then add the xanthan gum one teaspoon at a time until it thickens. Heat a griddle pan until hot, drizzle the cucumber batons with a little rapeseed oil and then cook on each side until charred and hot through. Remove from the heat and cut into small cubes. For the pickled ginger, place the vinegar, sugar and salt into a medium saucepan and heat until the sugar has dissolved. Add the ginger and simmer for 1-2 minutes, or until the ginger has wilted down. To serve, slice the salmon finely and layer onto each plate, top with pieces of the charred cucumber, teaspoon-sized blobs of the ketchup and the halved radishes. 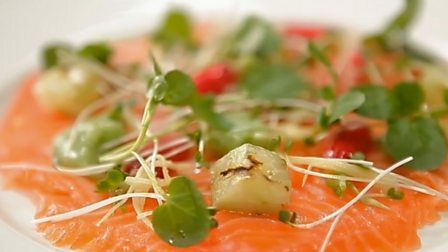 Scatter the pickled ginger, mustard cress and watercress over the top to finish.